However, as you read this, our local ice-rink is preparing to close down. Regardless of wether it is +10°C or -10°C this weekend. This is because in Switzerland everything is nicely planned. You know exactly when your tram will arrive: 4 minutes from now, as you can check on the electronic timetable at the stop – if you do not yet use an app for public transport. You also know exactly when the swimming pools open. And it doesn’t matter should it still be snowing and should you prefer to go to the ice-rink instead. I can totally rationalize this and usually I like the perfectly reliable Swiss planning. Emotionally it pains me to find myself in front of a closed swimming pool on a sunny September day. Anyway, the ice-rink is closing soon and so they organised a disco. We pack our skates; waterproof ourselves as it is still snowing heavily. But we wouldn’t want to miss the special atmosphere created by the music and the lightshow. Because of the snowfall, the ice-cleaning machine (who would have guessed that those things are called Zambonis in the US?) is of no use. We don’t care because we can have a snowball fight. We race through the crowd, play tag and try to dance on our skates to the rhythm of the music. This is not as easy as it sounds. You need to keep your balance and if try some fancy move, you might fall on your behind and this would be rather wet today. We admire the skills of those, who have learned pirouettes and jumps in their younger years. They glide gracefully to the music. We did have tons of fun and our cheeks are red, but I would have loved to impress the bystanders and myself with a little pirouette. Life offers many of us a whole lot of opportunities. And it is so much fun to try new stuff and to practise our beloved hobbies. Somehow, time flies and you need to make a decision. Music vs sports, theatre or a night out with friends – even I have learned that I cannot have it all. 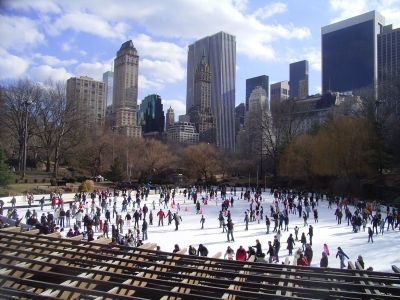 Chances are that I will never be able to do a pirouette on that ice-rink, even if I would really love to. But it doesn’t matter. I loved the wild skating around without any elegance. What I know doing, brings me a lot of joy. It is enough to be good enough. Let’s keep it at this.